Dr. Thani Ahmed Al Zeyoudi is the Minister of Climate Change and Environmentof the United Arab Emirates and Dr. Bradnee Chambers is the Executive Secretary of the Convention on the Conservation of Migratory Species of Wild Animals. BONN - The on-going bleaching of coral in Australia’s Great Barrier Reef continues to generate great concern worldwide. Islands of plastic waste in the oceans contaminating the food chain make the headlines. So why then is there a deafening silence on the deteriorating condition of the world’s seagrasses? One species that depends almost exclusively on seagrass is the Dugong (Dugong dugon), which is found in shallow tropical waters of the Indian Ocean and South-west Pacific. Dugongs are almost exclusively herbivorous and rely on seagrass and algae for food. Their numbers have declined significantly over recent decades through loss of the habitats upon which they depend, as bycatch from fisheries, and through targeted hunting. Dugongs are long-lived, slow breeding animals, making them particularly sensitive to stresses from growing human impacts. Even with the most favourable conditions, the population is likely to grow at only a -slow rate. Classified globally as “Vulnerable” on the IUCN Red List, the injury or death of just a few adults within a population can spark a significant drop in numbers with very slow recovery rates. 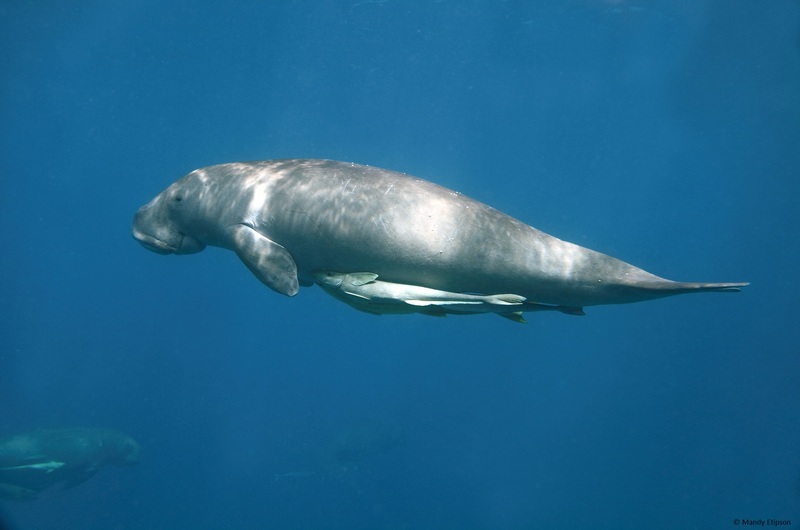 There is no simple solution to environmental degradation, but there are some basic principles that apply to Dugongs (and as we know in the Convention on Migratory Species to elephants, birds of prey and marine turtles). Conservation depends on partnerships with communities to improve their livelihood and well-being at the same time as changing activities that threaten dugong and seagrass. Incentives are an indispensable means to achieve better Dugong and seagrass conservation by encouraging changes in behaviour and building viable alternative livelihoods. The solid foundation laid locally can then be reinforced through policy and planning changes by Governments. Leaving aside the fascination of these strange but placid creatures, Dugongs are important barometers of a healthy ecosystem and every effort must be made to reverse their decline. With extensive seagrass meadows the waters of the United Arab Emirates host a significant portion of the world’s second largest population of Dugongs, making it a key location for the monitoring and conservation of the species. But one country’s actions are not enough. Recognising that more than 40 countries with Dugongs need to work together to protect them, the UAE has for many years backed the Secretariat of the CMS Dugong Memorandum of Understanding (Dugong MOU), which has been located in Abu Dhabi since 2009 with generous support from Environment Agency - Abu Dhabi, on behalf of the Government of the UAE. This week delegates from twenty-five countries, along with the world’s leading dugong and seagrass experts, will meet in Abu Dhabi under the auspices of the Dugong MOU to advance international policies aiming to ensure the Dugong’s survival and conserve seagrass meadows. A new online tool will be launched to help people assess and understand the interactions between dugongs, seagrasses and human communities. This will complement significant financing already mobilized by the Dugong MOU Secretariat through a four-year multi-million dollar project under the Global Environment Facility. Currently managed by the Mohamed bin Zayed Species Conservation Fund the project is under way in eight key Range States. If we can encourage communities in these and other countries to adopt practices that don’t destroy seagrass and accidentally catch dugongs, we will have helped them secure their future and the future of dugongs and seagrass meadows for generations to come.